UCLA’s Leonard Rome, Meng Wang, Danny Abad, Valerie Kickhoefer and Shaily Mahendra discovered that nanoscale “vaults” containing enzymes were effective at cleaning polluted water. By using nanoparticles filled with enzymes, researchers from UCLA have developed a safer and faster way to remove pollutants from water. A team of researchers from the California NanoSystems Institute at UCLA has found a new way to use enzymes to remove pollutants from water that is cost- and energy-efficient, able to remove multiple pollutants at once, and minimizes risks to public health and the environment. The advance could be an important new step in the effort to satisfy the world’s need for clean water for drinking, irrigation and recreational use. Current methods require multiple steps and involve chemicals that react to heat, sunlight or electricity. Scientists previously had shown that polluted water could be cleaned using enzymatic activities of naturally occurring bacteria and fungi, which breaks down pollutants into their harmless chemical components. But that method carries the risk of releasing dangerous organisms into the water. The new UCLA technique, developed by a team led by Shaily Mahendra, a UCLA associate professor of civil and environmental engineering, and Leonard Rome, a professor of biological chemistry and associate director of CNSI, is a variation of that method. The researchers put enzymes into nanoscale particles called “vaults,” then deposit the tiny particles into polluted water. Their method is described in an article published in ACS Nano. Mahendra said microbial processes in water that are part of the natural system of biodegradation would eventually break down pollution in our water, but only over a very long period. Nanoscale vaults are tiny particles — just billionths of a meter across — that are shaped like beer kegs. Mahendra said the new method is effective because the vaults protect the enzymes, keeping them intact and potent when placed in the contaminated water. The scientists tested the method using an enzyme called manganese peroxidase. They found that over a 24-hour period the vaults removed three times as much phenol from the water as the enzyme did when it was dropped into the water without using vaults. They also discovered that because the manganese peroxidase remained stable inside of the vaults, it was still able to remove phenol from the water after 48 hours. Free manganese peroxide was completely inactive after 7 1/2 hours. Vault nanoparticles, which are constructed of proteins and are present in the cells of nearly all living things, were discovered by Rome and Nancy Kedersha, his then-postdoctoral student, in the 1980s. Each human cell contains thousands of vaults, which themselves contain other proteins. But Rome and his colleagues eventually devised a method for building empty vaults that could be used to deliver drugs to specific cells the body to fight cancer, HIV and other diseases. The research contributes to the goals of UCLA’s Sustainable L.A. Grand Challenge, a campuswide initiative to transition the Los Angeles region to 100 percent renewable energy, local water and enhanced ecosystem health by 2050. Mahendra is also helping develop the work plan for Sustainable L.A.
Mahendra said the new technique could be scaled up within a few years for commercial use in polluted lakes and rivers, and vaults could be added to membrane filtration units and easily incorporated into existing water treatment systems. Vaults containing several different biodegrading enzymes could potentially remove several contaminants at once from the same water source. They would be unlikely to pose risks to humans or the environment, Rome said, because vaults grow in the cells of so many species. The vaults containing manganese peroxidase used for the new study were built by a team led by Valerie Kickhoefer, an associate researcher working with Rome. 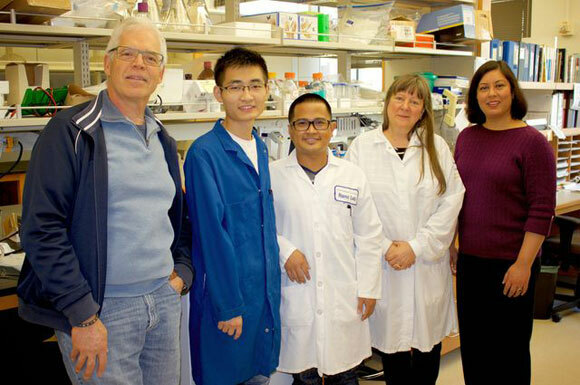 Also contributing to the study were first author Meng Wang, a graduate student in Mahendra’s lab, and UCLA staff research associate Danny Abad. Electron microscopy for the study was conducted in CNSI’s Electron Imaging Center for Nanomachines. The research was supported by the Strategic Environmental Research and Development Program (award ER-2422) and the UCLA department of civil and environmental engineering. Be the first to comment on "UCLA Nanoscientists Develop a Better Way to Remove Pollutants from Water"